From inside the Tokamak Pit, looking out past the successive levels of the ITER bioshield. 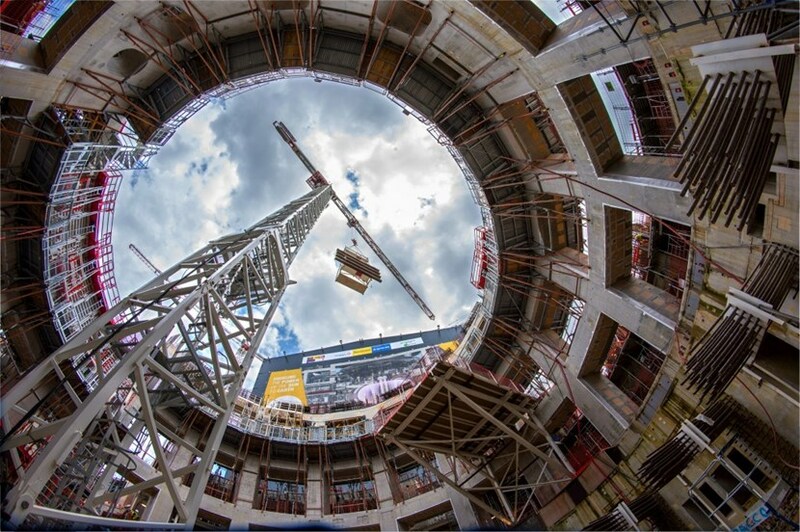 Like a rocket aiming for the stars, crane C1 rises from the deep well of the Tokamak Pit. There are many parallels to be drawn between the quest for fusion and space exploration. Both challenges are among the most ambitious mankind has ever attempted; both herald a new age in the history of civilization. Take in this spectacular view while you can—soon, a temporary steel cap will be installed that will shut off the lowest level from the rest of the "well." This cap will protect workers below while work proceeds on the upper levels of the bioshield. Then, once the building has risen all around and the Tokamak "Pit" is protected from the elements, this space will be progressively filled in with the components of the machine. In late 2024, a one-year integrated commissioning period is planned to test the systems together. Countdown will then start to First Plasma, scheduled in December 2025.